The gunman behind Sunday night's mass shooting in Las Vegas planned to flee, and he may have had help with planning the massacre, officials suspect. Stephen Paddock was "living a secret life, much of which would never be fully understood", Sheriff Joe Lombardo told reporters. The gunman's girlfriend said she had no idea what he was plotting. Paddock's motive for killing 58 people in the largest mass shooting in modern US history remains a mystery. Police found the 64-year-old former accountant dead in a room on the 32nd floor of a hotel after he sprayed bullets on concert-goers below, injuring hundreds. He apparently turned one of his many guns on himself as police closed in. In a press conference on Wednesday, Clark County Sheriff Lombardo was asked if he saw evidence that Paddock had planned to escape after the attack. The sheriff said "yes". Asked what it was, he said: "I can't tell you." Sheriff Lombardo was asked by a reporter if he thought Paddock had carried out the attack alone. "You've got to make the assumption he had to have some help at some point," the sheriff replied. "Maybe he's a super guy, maybe he was working out all this on his own, but it would be hard for me to believe that." The possibility that Paddock could have had an accomplice is a twist in the investigation. In the aftermath of the shooting officials described him as "a lone wolf" and said he was "solely responsible for this heinous act". The FBI's Aaron Rouse said no link to terrorism had been found so far, but they would not discard the possibility. As traffic files past on a busy Thursday morning, a large purple billboard, advertising the Route 91 Harvest Festival, can be seen above. Behind it, the stage with the lighting rig is also in view. The scene of Sunday's massacre appears almost untouched - as you gaze across the busy highway two broken windows on the 32nd floor of the Mandalay Bay Hotel break up the otherwise smooth gold facade of the building. It is hard to even imagine how gunfire could have travelled so far - from such a great height and distance - on innocent concertgoers. The hotel itself has reopened - a queue of people wait to check in at the marble counters, others sit at slot machines doing what people do best here. Outside on the boulevard, a makeshift memorial is growing in size as people bring candles, flowers and photos, and write messages of love with chalk. The motto of this city is "What goes on here, stays here" - that mantra rings true now. The tragedy of Sunday night will never be forgotten, but people are resilient, and determined to move on. Police are investigating whether the mass murderer originally planned to target other music festivals. 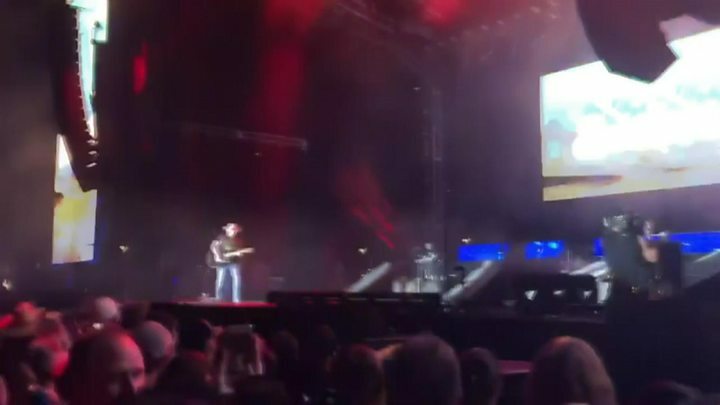 Chicago police said they were looking into reports that Paddock booked a hotel room in August overlooking the Lollapalooza music festival in the Illinois city. Former President Barack Obama's daughters were among the thousands of revellers. It has also emerged that a week before his massacre, Paddock booked into a central Las Vegas apartment. It was in a high-rise tower overlooking another open-air concert, Life is Beautiful, where acts included Muse, Lorde and Chance the Rapper. The sheriff said more than 100 investigators had been combing through "disturbed and dangerous" Paddock's life. Some 33 of the 47 weapons the suspect owned were bought in the past year. Paddock - who was gambling just hours before he began shooting - had set up cameras both inside and outside the Mandalay Bay Hotel suite to see anyone approaching the room, police said. Photos of his hotel suite published by Boston 25, a TV news station, showed gun littered around the floor. What did Paddock's girlfriend say? Marilou Danley, who was out of the country at the time of the shooting, has been described by US authorities as a "person of interest". She voluntarily flew back to Los Angeles from the Philippines on Tuesday night to speak to the FBI. 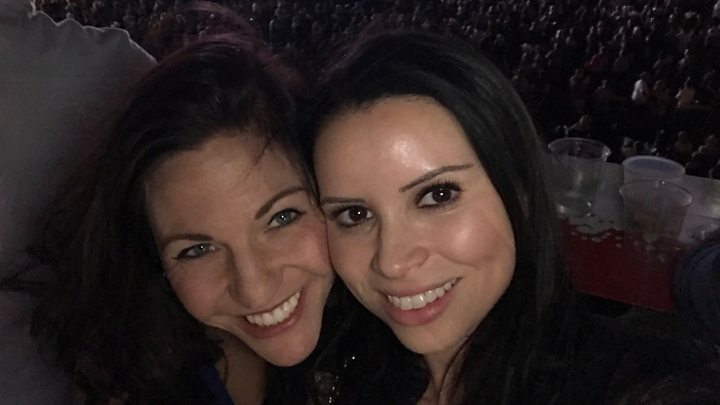 Two weeks ago, she said Paddock surprised her with a plane ticket to visit her family in the South East Asian country. Paddock "never said anything to me or took any action" which she understood as a warning of what was to come, she said in a statement read by her lawyer. While she was in the Philippines, he wired her $100,000 (£75,400), saying it was to buy a house. "I was grateful, but honestly I was worried it was a way for him to break up with me," she said. "It never occurred to me in any way whatsoever that he was planning violence against anyone." Her sister earlier told Australian outlet 7News that Ms Danley "was sent away... so that she will not be there to interfere with what he's planning". Paddock checked into a suite in the Mandalay Bay Hotel on 28 September, reportedly using some of Ms Danley's identity documents. 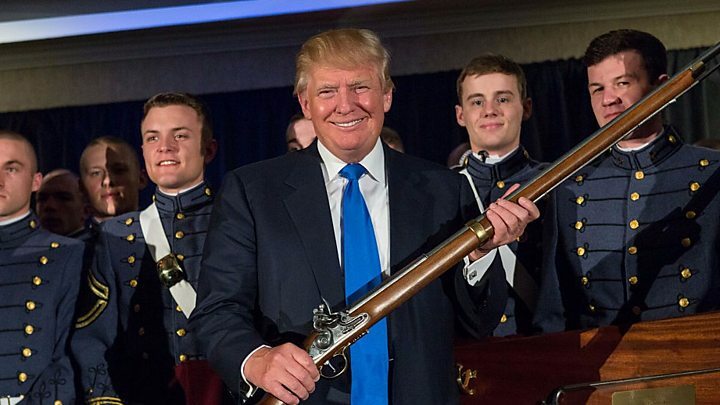 Media captionWhat's Donald Trump said about guns and gun control? Will the attack lead to gun control? 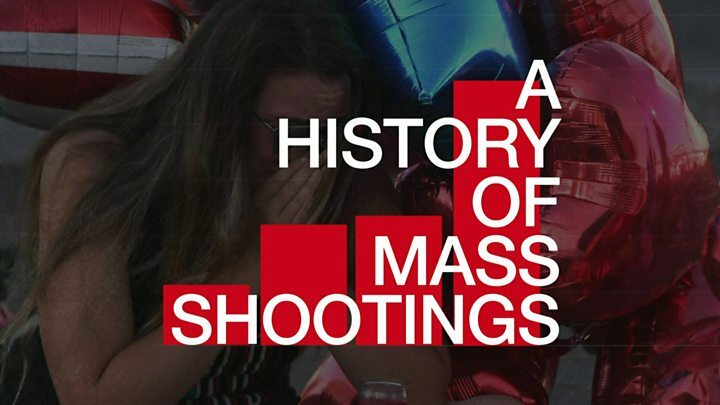 Particularly bad US mass shootings typically spark renewed calls for gun control measures, which tend to falter as the public horror fades and the lobbying might of the National Rifle Association is brought to bear on Congress. But some Republicans have said they might be open to the idea of banning a fully legal firearms accessory used by Paddock to such deadly effect. Twelve of his weapons were fitted with a bump stock, which speeds up fire to many hundreds of rounds per minute. Is the gunman a terrorist? What does Las Vegas want Trump to do in wake of shooting?